SOUTHLAND - INVERCARGILL AND STEWART Is. U.S.FTC Guidelines note: we act as an affiliate for several companies that feature on our website. In some cases we may earn a commission from referrals to those companies. For further information please refer to our Privacy and Disclaimer policies which can be found in the "US" tab. The majority of Fox Glacier accommodation is located in Fox Glacier village. Fox Glacier village is located on State Highway 6, on the South Island's West Coast. It's around two hours drive from Hokitika, about three to four hours drive from Wanaka, and around thirty minutes drive from the equally scenic Franz Josef. The village has a range of places to stay, together with a selection of bars, pubs, restaurants, gift shops, a petrol station, and a small supermarket. Please note: If you are heading South, Fox Glacier is the final place to obtain fuel for 120 kilometers. The actual Fox Glacier is located around five kilometers from the village. You can see the glacier by walking from the carpark on Fox Glacier Access Rd to the terminal face of the glacier. There are also various other walks in the area, and a wide range of guided tours, heli flights, snow landings and ice walks. To see the range of tours and to read customer reviews, just click here. You can learn lots more on the informative Department of Conservation (DOC) website here. 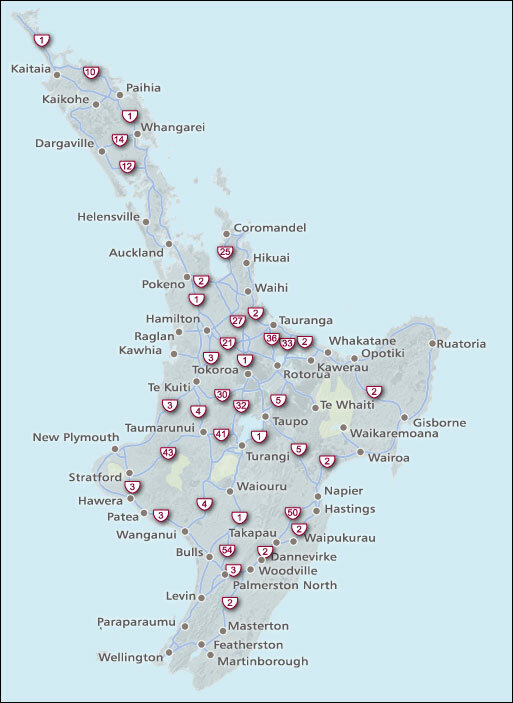 New Zealand is one of the most customer focused destinations in the world. There's so much to see and do here, and of course, there's also a huge range of places to stay, no matter where you are in this beautiful land. To give you the very best choice of accommodation, at all levels, we've partnered with one of the world's leading accommodation providers, Booking.com. They cover the full range of Fox Glacier accommodation with everything from five star lodges to hostels and camp grounds. And best of all, you can read those very important customer reviews. To help you find exactly what you are looking for, just follow the quick links below. Then when you finish, just click on your browsers back button or scroll up the page. Centrally located in Fox Glacier village, Ivory Towers is the perfect budget friendly place to base yourself while you explore this amazing part of New Zealand. Owned by the same family for many years, the hostel offers guests a clean, comfortable place to relax. With open fires, spacious lounge areas, decking and three fully equipped kitchens, you are sure to have a great stay. There are a range of room types, with everything from dorm style share rooms, to self contained family rooms. Importantly, they also have a fully compliant disabled unit. There's a comprehensive video library (with hundreds of movies), a relaxing hot tub and sauna, and free wifi. Hire bikes are available, and of course the friendly staff are always happy to provide all the information that you need on what to see and do in the area. 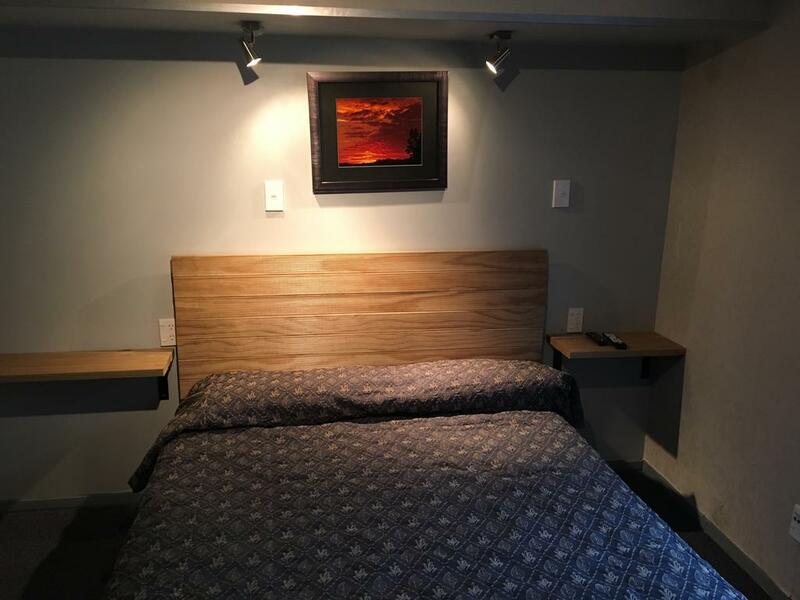 To read customer reviews and to check availability for Ivory Towers Backpacker Lodge Fox Glacier, just click here. 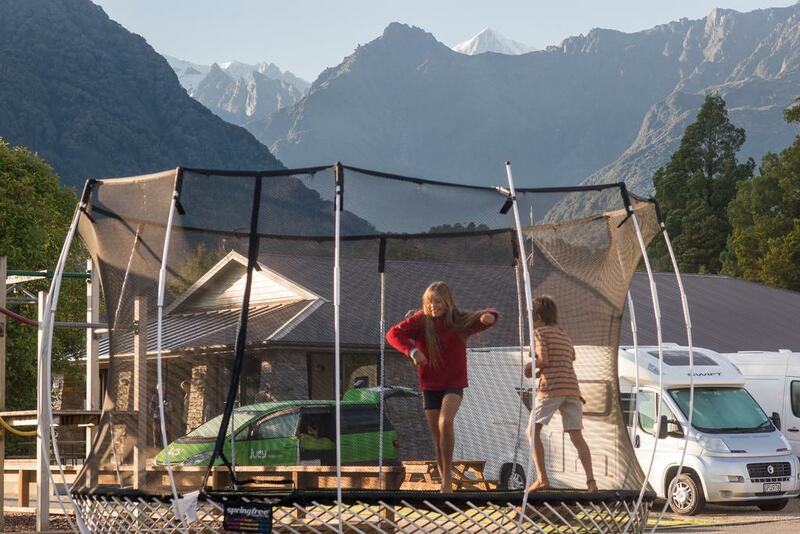 The Fox Glacier Top 10 Holiday Park is the perfect stopover. Their range of accommodation includes studio, one and two bedroom motel units, cabins, campsites (both powered and non-powered) and a large tent area. The setting is stunning and covers around ten acres. With the Southern Alps towering in the distance, a relaxing stay is almost a certainty, particularly if you choose to make use of the hot tub, which looks out towards the mountains. Beautiful! There's a large communal kitchen, a very well maintained shower block (with cosy heated floors), free gas BBQ's, a TV room and a coin operated guest laundry. Kids will love the extensive playground facilities, and will be begging you to hire one of the "fun bikes" for them. 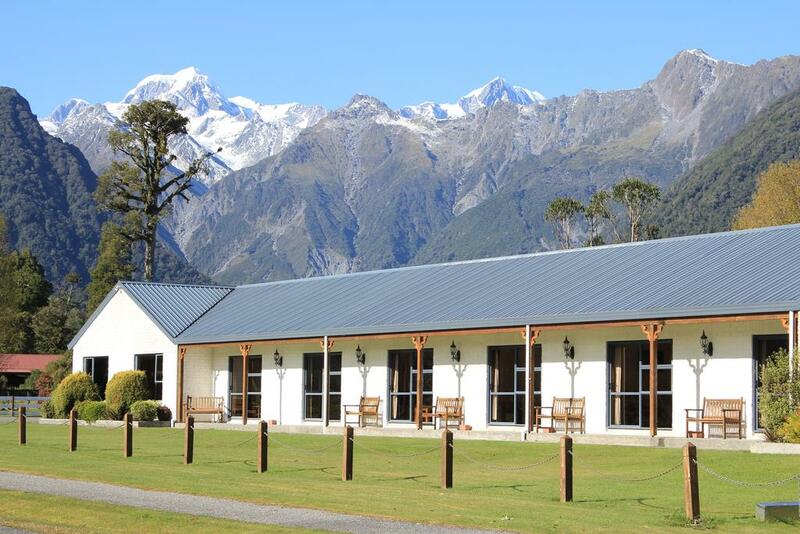 The Fox Glacier Top 10 Holiday Park is very popular with visitors. You can read what other guests thought about the Fox Glacier Top 10 Holiday Park, check availability and make your bookings here. Check out the views! How could you not want to stay here? Located a couple of kilometers from the village, along the road to Lake Matheson, the Mt Cook View Motel is very aptly named. As the sun sets of an evening, it's a real treat to watch the changing colors as the light slowly fades over Mt Cook. It's difficult to imagine a motel with better views than this. But it's not just the views that guests love about this motel. It's a peaceful, clean, modern haven, and the perfect spot to use as a base whilst exploring the region. Rooms range from studio rooms to one and two bed units. All have Sky TV, free wifi, good heating (including toasty electric blankets), and fully equipped kitchens. Six units even have spa baths. They also offer a booking service for local activities (try a glacier walk, or a heli flight and snow landing!). To read guest reviews, check room availability, and to make your bookings, just click here. 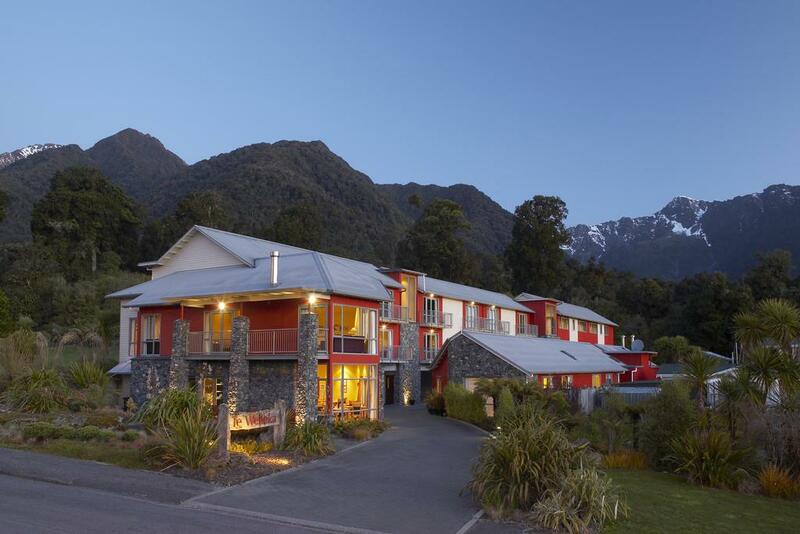 Centrally located in the village, the Distinction Fox Glacier Te Weheka Boutique Hotel is a beautiful hotel and highly rated by guests. Although it's centrally located, the setting is private and peaceful, and it has a lovely ambiance. All rooms are very well appointed. Together with a bedroom, lounge area and ensuite, each room also has a balcony. A morning coffee, looking out over the majestic surrounds is one of life's little pleasures. The hotel offers free WiFi, undercover parking (no charge) and a relaxing lounge area with a fire and library. Take some time to relax here and take in the views. The restaurant offers wonderful breakfasts, a perfect way to start your day's adventure. They also provide a booking service for all of the local attractions. This is a really nice spot to stay and highly recommended. 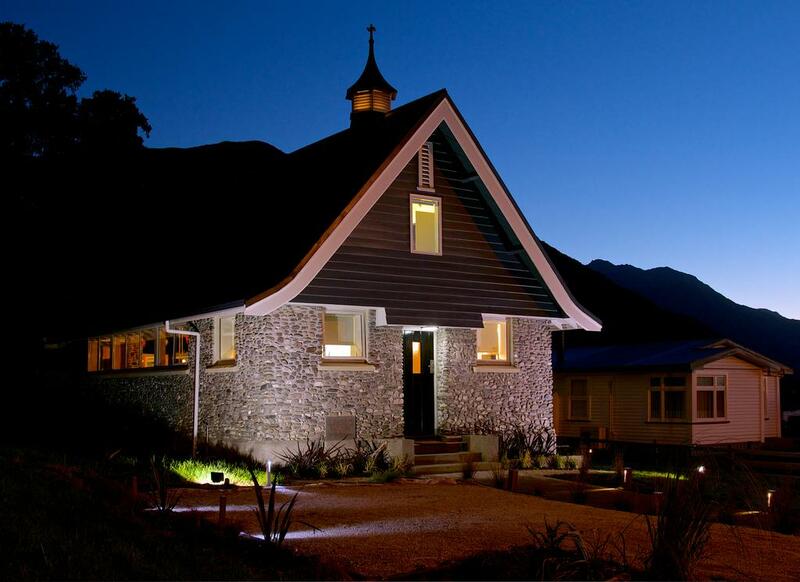 Located in the heart of Fox Glacier village, The Church at Fox is a luxurious self contained retreat. Built in 1954, and used as a church for around 50 years, this beautiful escape was converted in 2013 to a luxurious short stay experience. The owners have thought of everything, in an effort to make your stay here something to truly remember. A fully equipped kitchen with European appliances. An expresso machine and capsules. A bottle of Pinot Noir. Luxurious bathroom with rain shower. A sumptuous king bed with fine linen. Large TV with Sky, and DVD player. To read the amazing reviews, check availability and to book your stay, just click here. 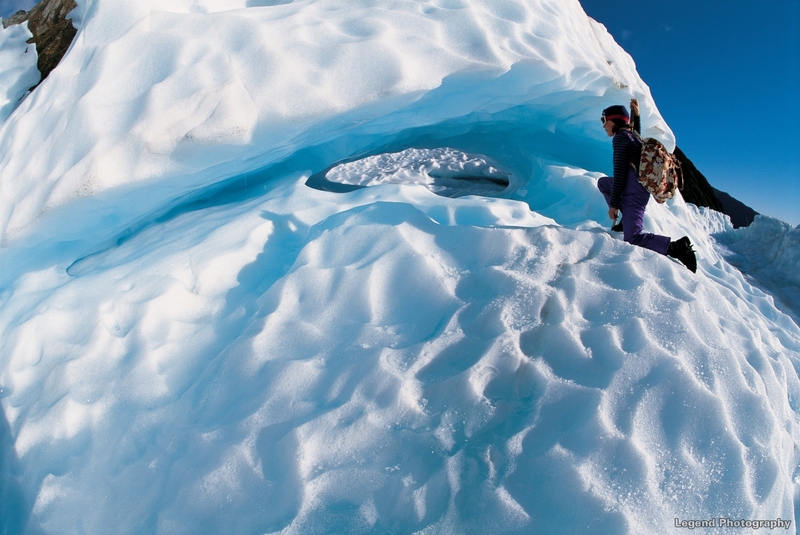 Want to search the full range of Fox Glacier accommodation? Do you need to hire a car or camper van for your visit to Fox Glacier? If you need to hire a car or motor home, we can help. With access to all the leading brands, and market leading rates, there's no need to look elsewhere. See what's available, check rates, and make your bookings here.